August 01, Islamabad: On the 4th day of the first session of the 7th Youth Parliament Pakistan, the members were addressed on the "Foreign Policy of Pakistan: Pak-US & Pak-India Relations" by two former Pakistani Ambassadors Mr. Masood Khan and Mr. Jehnagir Ashraf Qazi. Ambassador (Retd.) Masood Khan started the discussion by explaining how the relations of Pakistan with India, although sour from the time of partition, were greatly strained after the 1965 war. When asked about the Kashmir issue, Ambassador (Retd.) Ashraf Qazi was of the opinion that the Kashmir issue cannot be put aside when the talks for better relations are being done. He argued that the United Nations has already decided that the future Kashmir should be decided by a plebiscite, a proposal that should be binding on all the actors. But although Pakistan and the people of Kashmir argee with this, India has denied them this right and continues with human rights violations till today. Ambassador (Retd.) Masood Khan, in an answer to a question said that Pakistan should focus on its relations with China, to counter growing influences of other neighbors of the country. But despite all this, both the speakers recognized the great importance of having friendly relations with India and the positive impact it would have on Pakistan's economy. Ambassador (Retd.) Masood Khan, analyzed various aspects of Pakistan's foreign policy with the United States and how it had changed because of two main events: the USSR invasion of Afghanistan and the 9/11 terror attacks. He stated that Pakistan needs to improve its relations with the United States. He argued that contrary to the widespread belief among the people of Pakistan, which was also to a certain extent reflected in the Members of Youth Parliament, good relations with US were far more beneficial to Pakistan than not. He gave the example of China and how its strong economic ties with the US were one of the reasons that improved the technological and economic state of the country. Mr. Ashraf Qazi agreed to most of these arguments but maintained that Pakistan should only work towards a friendly relation with the US when in pursuance if its national interests. He said that no country is indefinitely good or bad in the foreign policy of a country, rather the circumstances and the needs define what it should be. Whether it is Pakistan's relation with the United States or with India, both the speakers emphasized the importance of using critical analysis rather than emotions. It was a very candid discussion, in which the speakers freely expressed, not the official stance of the Governments they served in, but their own. Later in the day, Mr. Nohman Ishtiaq, Public Finance Expert briefed the Members of Youth Parliament about the role of Parliament in the Budget Process. With reference to the separation of powers, he said that the provision of checks and balances that should form the basis of the budget process is not being utilized to its fullest. He said that Pakistan, Denmark and Bangladesh are the only democracies in the world where the Ministries may deviate from their allocated budget without approval from the legislature. In Pakistan, this has historically meant that with the presentation of each Budget, legislators are asked to sign off on appropriations and supplementary budgets from the previous financial year. Pakistan’s parliamentarians play a minimal role in parliamentary oversight. This needs to change if a positive change towards regulating expenditures and holding the government accountable is to happen. He also said that the budget is essentially a political document and a policy management tool that can be treated as an indicator of a government's priorities. In the Federal Budget 2015-2016, judging by the amount allotted to each of the Federal subjects, National Security, Power and Transportation and Communications figure as the most important. 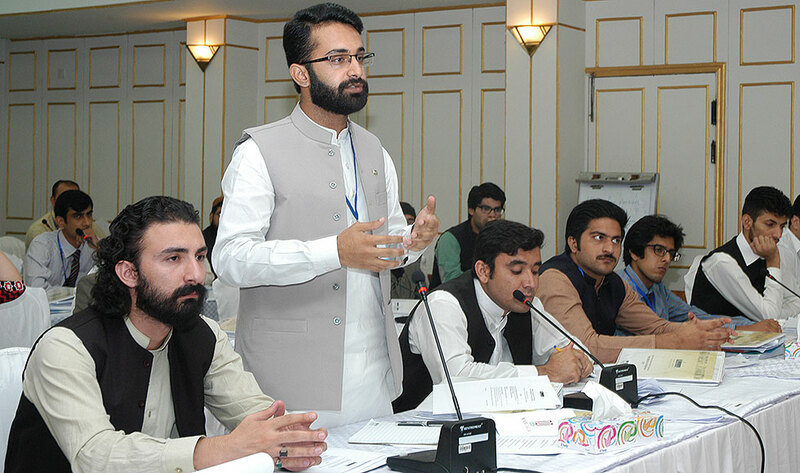 The Youth Parliament Pakistan is an initiative conceived, planned and facilitated by PILDAT. The 7th Youth Parliament Pakistan is supported by the Danish International Development Agency, Government of Denmark as recognition of the importance of young people's involvement in democracy and democratic practices.